As you might have noticed, I have been quite restrained when it comes to desserts in January. At the beginning of the month, alarmed by the frequency and intensity of my ‘taste testing’, I vowed to ditch chocolate for a month. Although I did not succeed completely, I made some progress and I feel that my cravings are now under control. 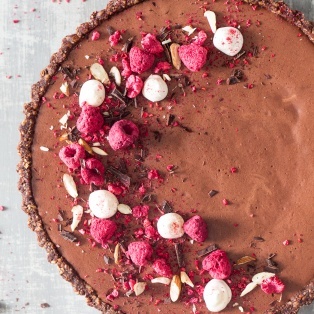 For those of you who noticed and mourned the lack of chocolate goodness on the blog, this recipe should certainly make it up to you. 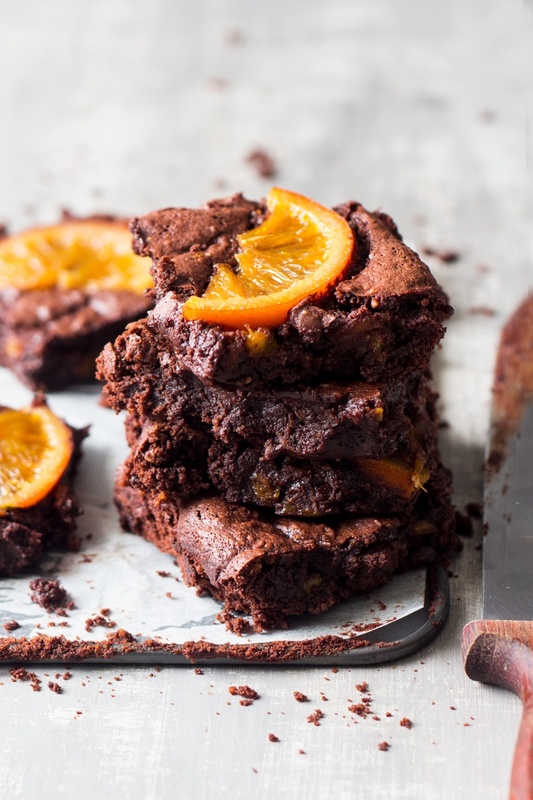 These gooey chocolate orange brownies are indecently chocolatey with bursts of orange flavour, which cut through the richness of the chocolate nicely. As they are rather rich and decadent, I advise you to cut them into small pieces and share them with your neighbours, far and wide. With Valentine’s Day drawing near it’s LOVE, instead of fear-mongering, division and hatred that should be on the agenda right now. I feel that the world really needs that at the moment and although a cake (no matter how good) won’t solve any of the issues we are facing, it facilitates conversation and dialogue and that’s already a good thing! 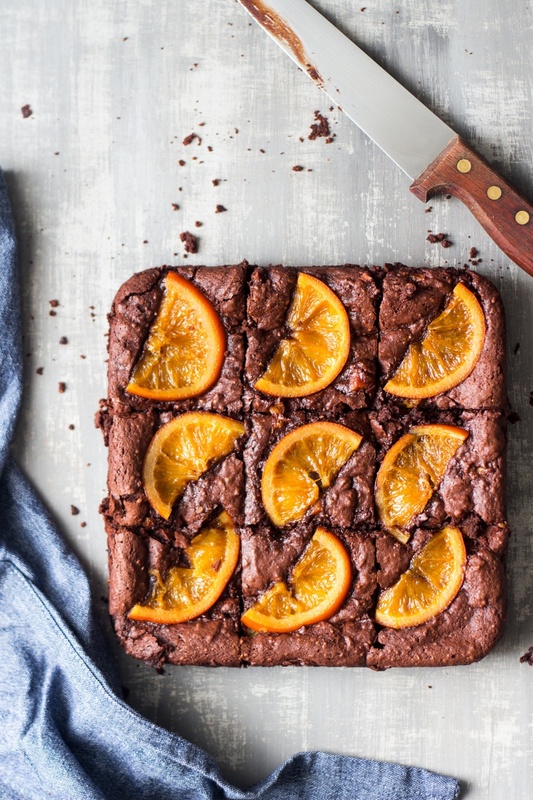 PS: If you make our gooey chocolate orange brownies, don’t forget to tag us on Instagram as @lazycatkitchen and use the #lazycatkitchen hashtag. We love seeing your takes on our recipes! If you are using fresh oranges, wash them very well, place them in a bowl and cover with boiling water for a few seconds to dewax and sterilise them. Take them out and cut them into medium slices. Place orange slices in a medium pot with 1 cup of water and ½ cup of sugar. Cover with a lid and simmer on a very low heat (I use setting 1 out of 6) for about 1 hour, until orange slices are soft and semi-transparent. 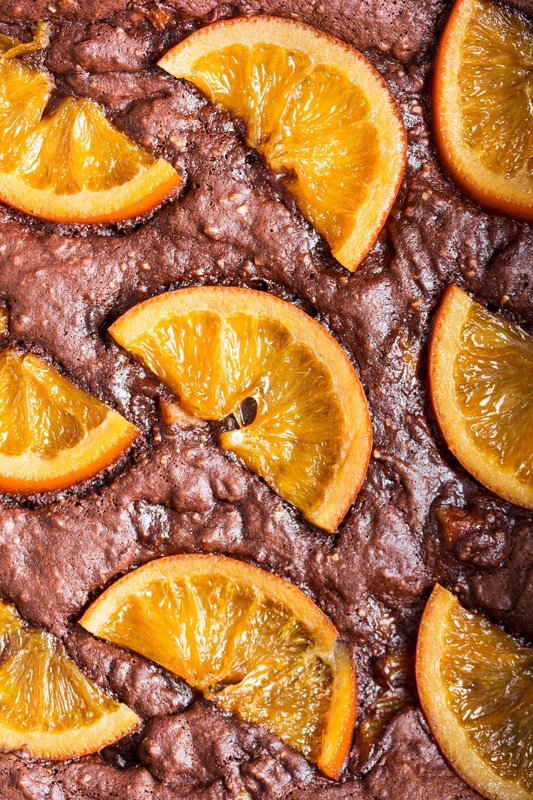 Drain orange slices on a few pieces of kitchen towel so that you don’t add extra moisture to the brownies. Chop or break up the chocolate into smaller pieces with your hands. Place chocolate in a glass bowl over a water bath (bain-marie). Make sure the bowl doesn’t touch the water. Simmer on a very low heat until the chocolate has melted. Add coconut oil and give the mixture a good stir to combine the two. Take the bowl off the pot and allow the chocolate to cool down. Place almond flour, cornflour / cornstarch, buckwheat flour and baking powder in a small bowl. Mix very well. Pre-heat the oven to 180° C / 355° F. Grease a brownie tin (I used a 19 cm / 7.5 ” square tin) with a little bit of olive oil. In a clean metal or glass bowl whip aquafaba until you get stiff peaks. It is very important that the bowl has no grease residue as this will prevent the aquafaba from reaching stiff peaks. Once the aquafaba is at the stiff peaks stage (turn the bowl upside down, if aquafaba does not slide down at all, it means that it has reached stiff peaks), start adding sugar very gradually, half a tablespoon at the time, whipping well after each addition. Chop 6 orange slices (drained of excess moisture) finely and gently fold them into the batter. Spoon the batter into the brownie tin. Decorate with orange slices – I used 9 halves, leaving generous gaps between them. 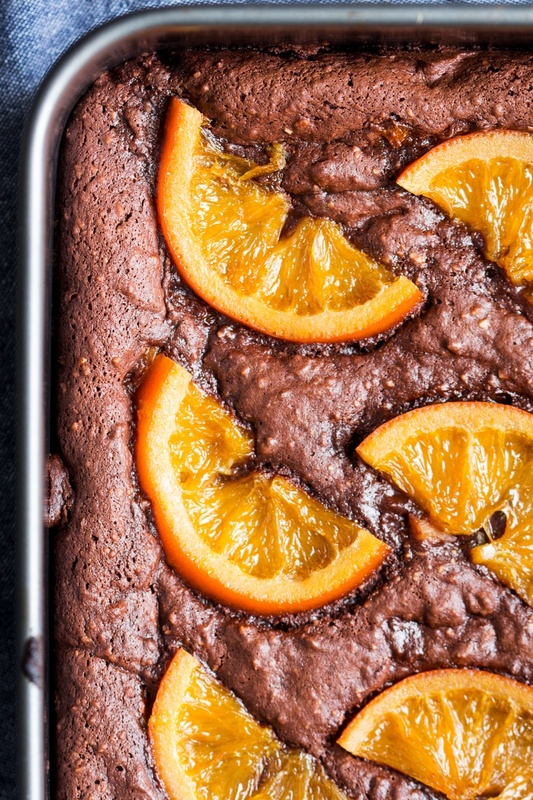 Do not cover the entire brownie with orange slices as they will prevent the top from getting crispy. You can also bake the brownies without orange slices (for an even crispier top) and add orange slices afterwards, before cutting the brownies. Bake for 30 (they will be über gooey like in my photo) or 35 mins (they will be a bit firmer but still fudgy). Remove from the oven and let the brownies cool COMPLETELY before cutting into 9 or 16 pieces. These brownies are rather rich so I recommend 16 smaller pieces. *You can use most nut flours / ground nuts here: hazelnuts, pecans and walnuts will work. **If you are using bitter (rather than semi-sweet) chocolate, you may want to up the amount of sugar. What is aquafina??? I want to start trying some of your recipes but am finding some ingredients that are strange to me. Orange and chocolate a perfect combination. They look oooey-gooey inside and crackled on top. I suppose I could make a pan for Valentine’s day and cup then into heart shapes. Then I would get to eat all the scraps. Love this recipe photo on foodgawker 🙂 Looks delicious! Also pinned onto our dessert board. Heading to kitchen now to bake up these brownies. Hi. 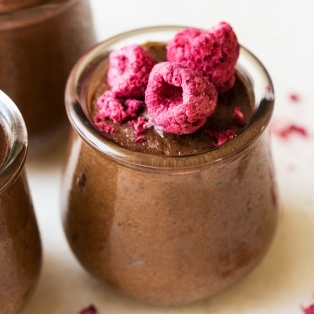 These look amazing and I can’t wait to try them, but would I be ok to use gluten-free oat flour in place of the buckwheat? Cheers! 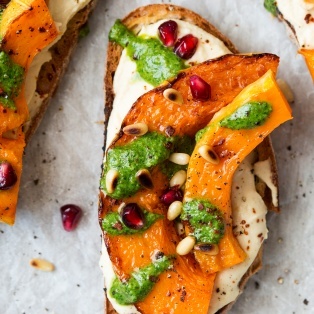 Can I just omit the oranges in this recipe (or substitute for another fruit)? Yes, you can skip the oranges if you wish. I haven’t tried using any other fruit but I reckon frozen raspberries would work well, for example. Worth trying for sure! Just make sure whatever fruit you use is fairy dry as adding extra moisture to the batter may spoil the end result. Hope that helps. Thanks for the recipe, it looks amazing! Can you suggest any alternative to buckwheat flour as I have struggled to buy that before where I live. Can’t wait to try this! 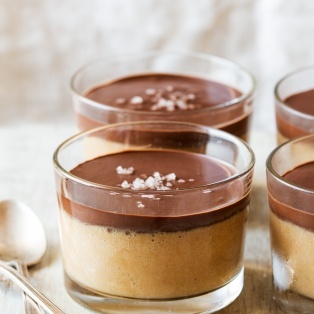 Do you think that the equivalent amount of Coconut sugar would work in this recipe instead of caster sugar? Hi Emily it might work for recipes which call for soft brown sugar eg cakes, cookies. I tried substituting coconut sugar in a tarte tatin recipe and it was a total disaster! 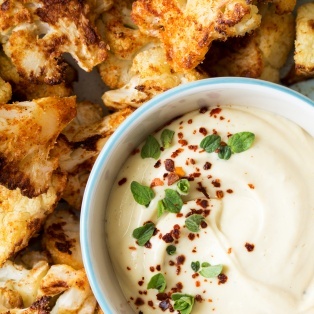 Would it be possible to get a calorie count for your recipes? These are just so delicious , I’m making them again! Hello Ania is it possible to substitute the buckwheat flour with coconut flour or gluten free flour mix? Thanks.